Do you know about henna? Well I will tell you. Henna is a plant that is used to dye stuff. It has been used for over 9000 years. They use henna at weddings to decorate the bride’s hands and feet. If you get one while getting married you would not have to do house work until it fades. This means NO housework for about 3 or 4 weeks. AWESOME! Did you know Cleopatra the queen of Egypt, used henna before? The poor that could not afford jewelry used henna because it is a lot cheaper. 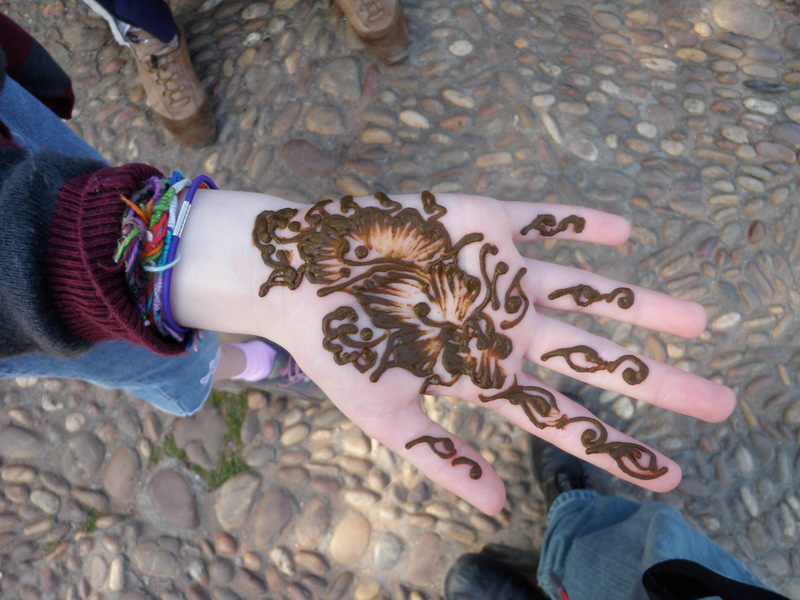 As we were walking to a garden in Rabat, we saw women with henna. The henna woman applied henna on our hands. I got a flower. Mommy got a bracelet with flowers and vines. It took 30 minutes to dry. At first it looked like poop. Then when I pealed it off it looked orange. Henna can be the color of yellow, orange, or red. I liked the henna. Do you know how to make henna? 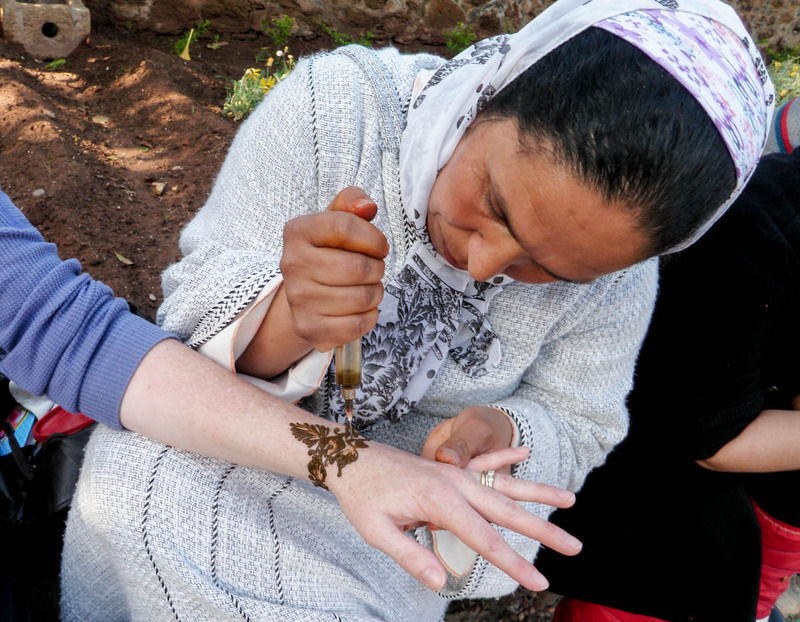 This is how to make henna. Crush the leaves to a powder. Add something to make a cream. Henna grows best at 120 F. That is really hot! Henna wilts when the temperature is below 50. Henna is used to cool people down when it is hot. 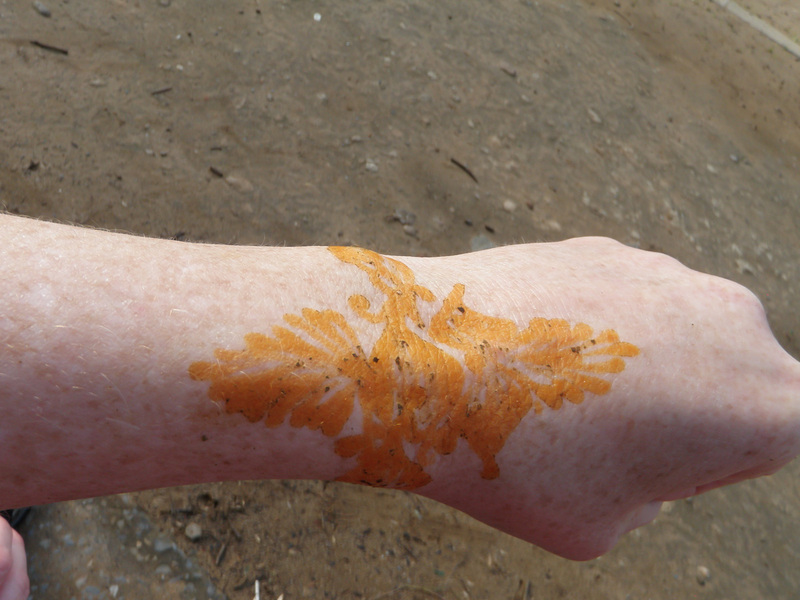 Henna can be used as sunblock. Now you know all about henna! 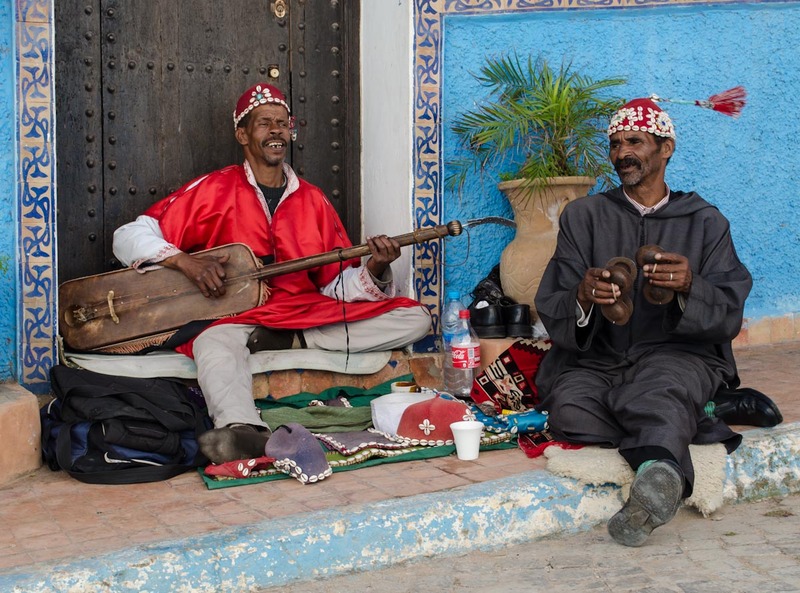 As we were wandering through the colorful streets of the Kasbah, the oldest area in Rabat, we came across these street performers. They were happy to have their photos taken, for a small fee. We gave them 2 Dirhams (about 25 cents US) which they were happy with and we got some amazing photos. This one is our favorite and we hope you enjoy it. 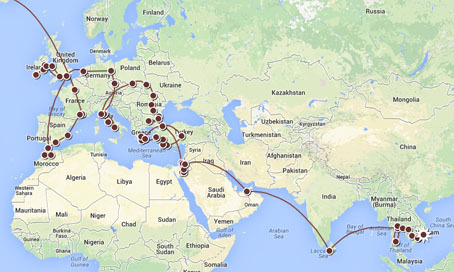 Jason and I frequently joke that if we were to write a book about our around the world adventures it would be titled, “Travel-Junkies: Just Out Looking for Romans.” It seems like those Romans were practically everywhere and as we have traveled, I have developed a “slight” obsession with anything Roman. When our guidebook mentions Romans ruins, I know that I must see those ruins. When I found out that Morocco contains this amazing Roman site called Volubillis and it is an UNESCO world heritage site to boot, I just knew we had to go. 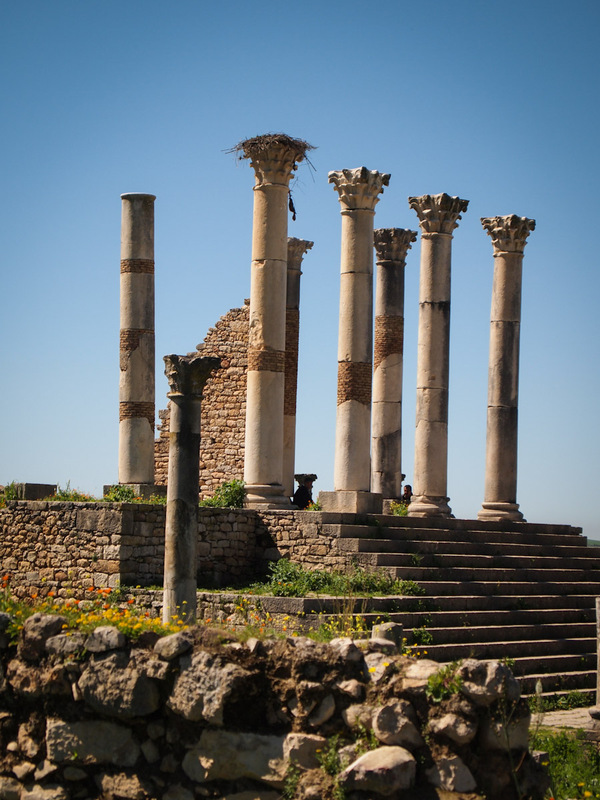 When I mentioned my desire to see Volubillis, Jason raised his eyebrows and said, “I don’t think so!” He had imagined that Volubilis was out in the middle of nowhere and sounded like it would be difficult to reach. 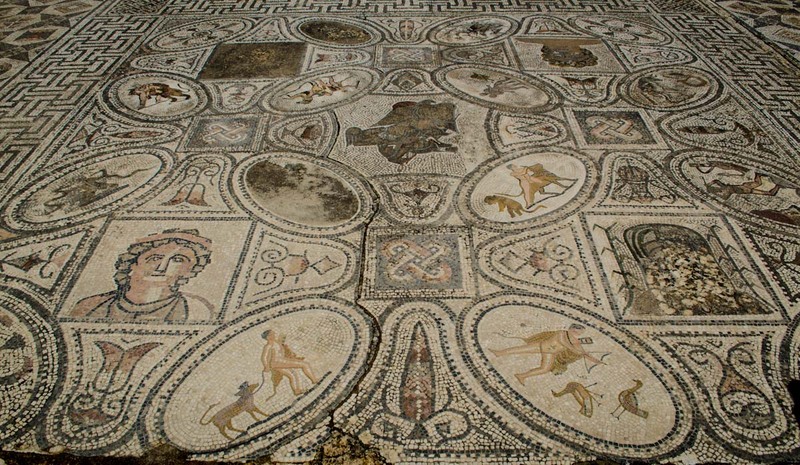 Initially, it looked like we would need to take a train to Meknes and then negotiate with a grand taxi to take us to Volubilis, have the taxi wait, and then have the taxi take us back to Meknes. After a big scene with a grand taxi over cost when we first arrived in Morocco, we had avoided taking the grand taxis. Jason was envisioning that an argument or mistranslation/miscommunication would occur, resulting us being broke and/or stranded at Volubillis until goodness knows when. 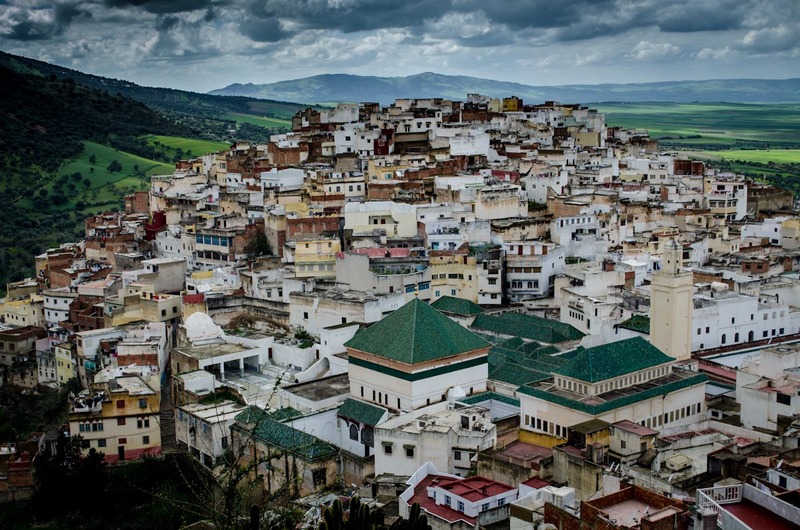 Fortunately for me, after further research, Jason found that there was a town called Moulay Idriss very near the site and that there was another option besides the grand taxi for transportation. Well at least to Moulay idriss, the city bus. 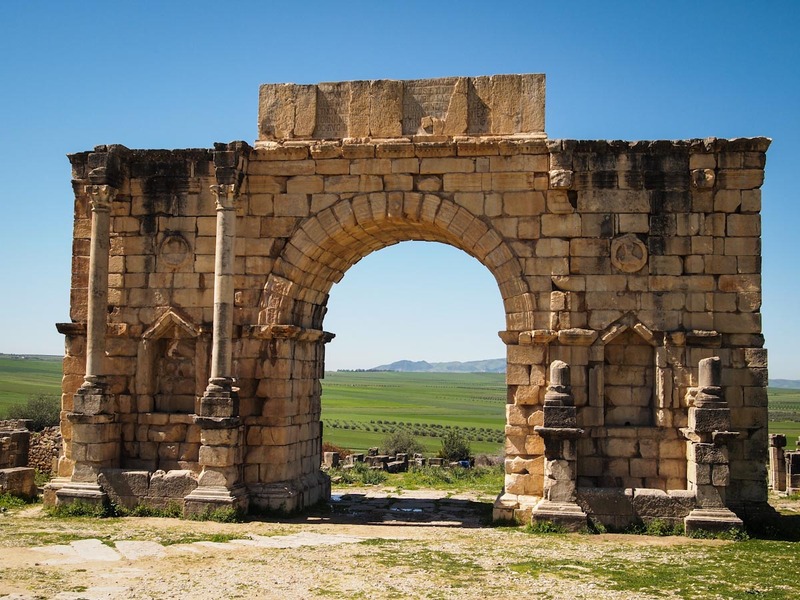 After convincing Jason that we really needed to see Volubillis, we decided to make it an overnight adventure where we would spend the night at Moulay Idriss and then walk over to Volubilis in morning. 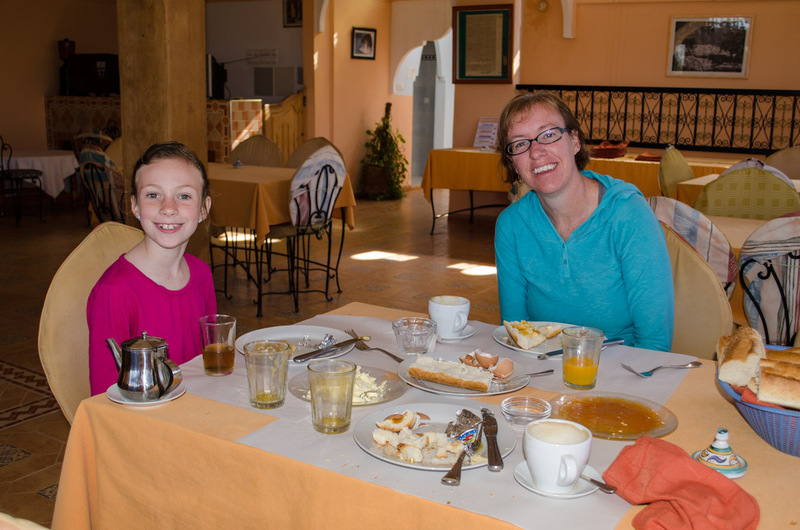 We had a lovely night at Moulay Idriss and the next morning after a delicious breakfast, we walked to Volubilis. 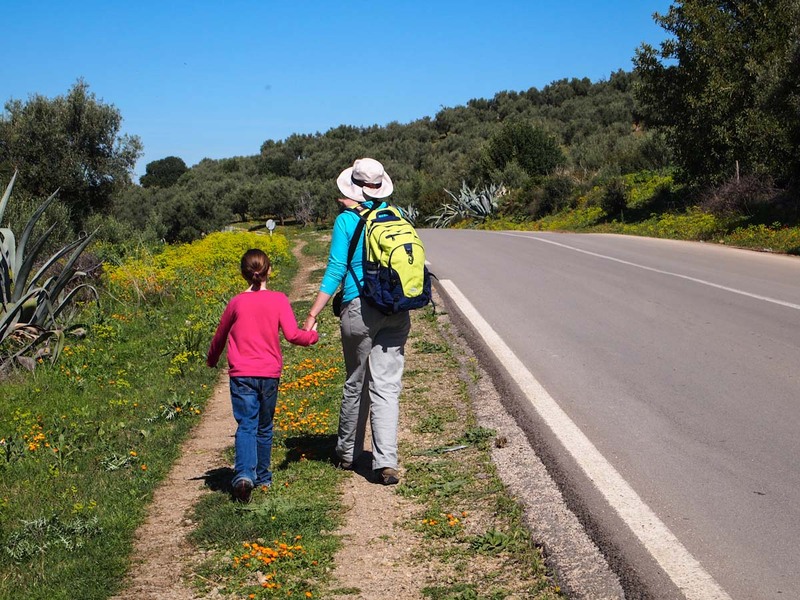 It was about a 45-minute walk along wheat fields and ancient olive trees. We found it to be very peaceful. 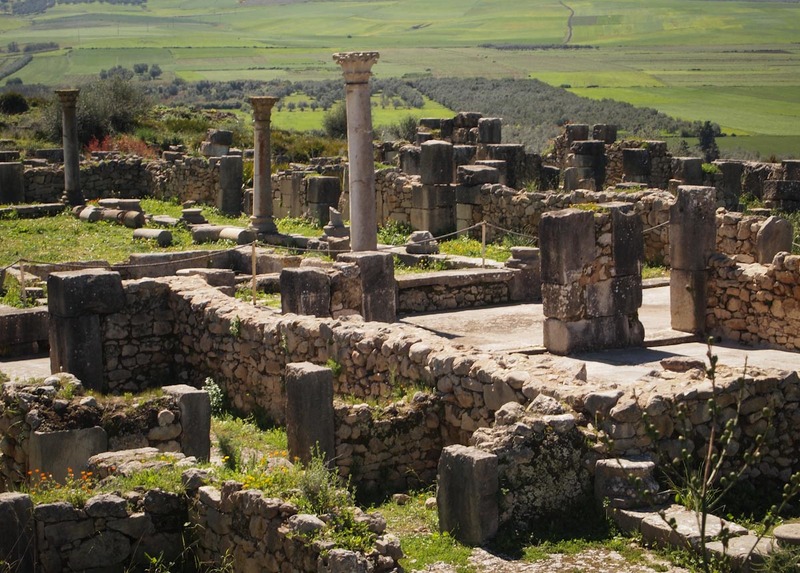 When we arrived at Volubilis, there were several tour buses already there and along with tons of tourists. 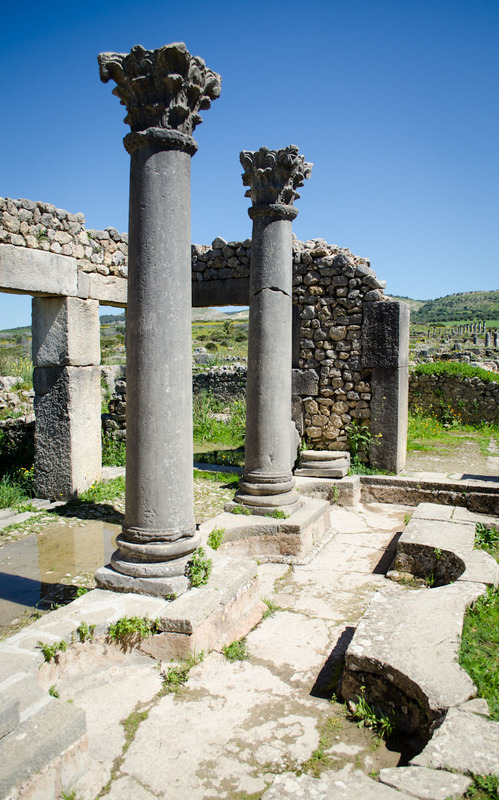 Walk to Volubilis. 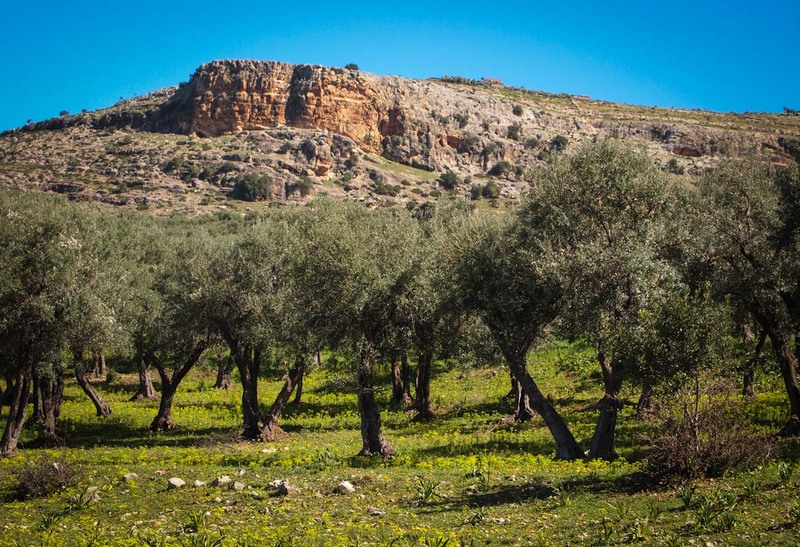 Olive groves. 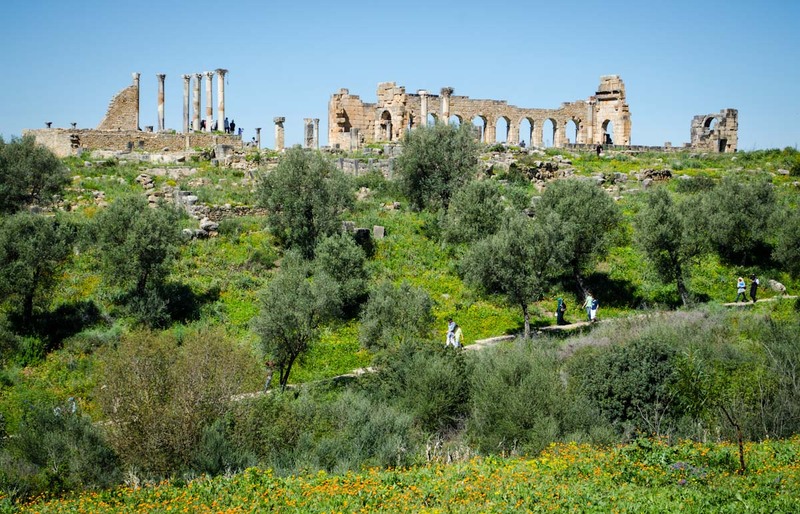 After seeing Volubilis, I can see the attraction. 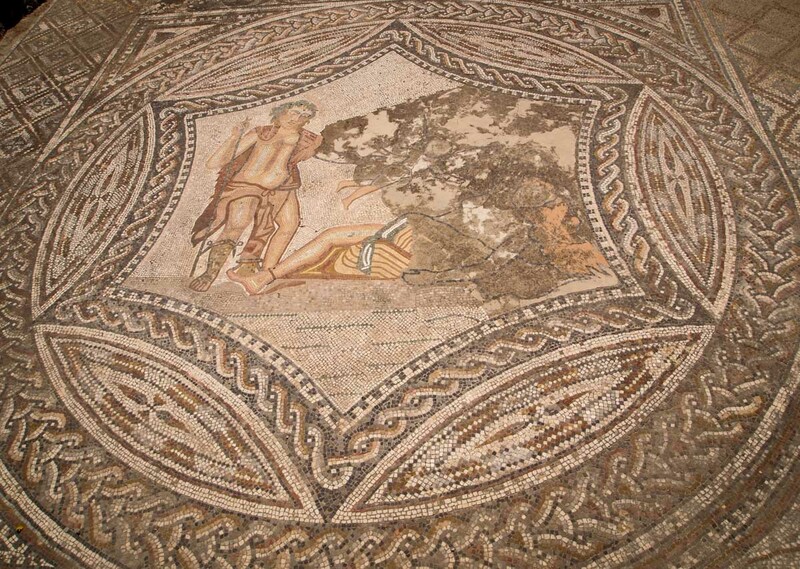 Volubilis is set in a peaceful green valley and is known for its’ wonderful mosaic floors. 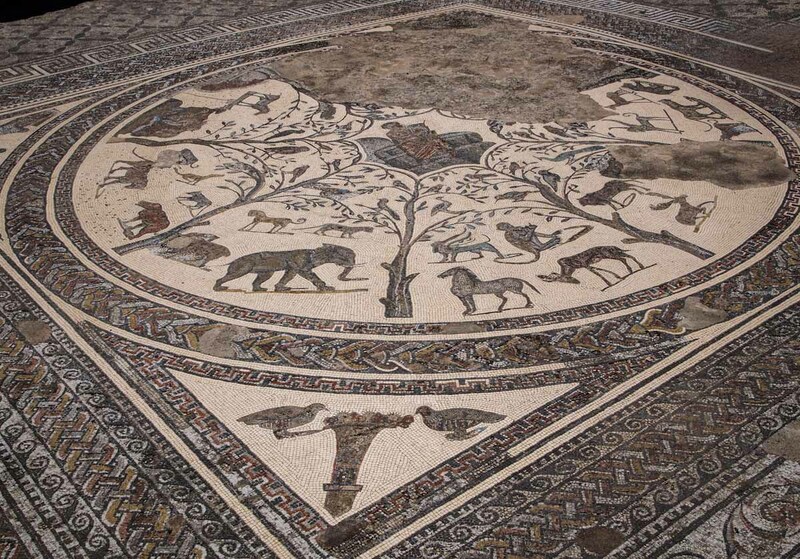 There is just not one mosaic floor at Volubilis, but numerous ones that are well preserved. 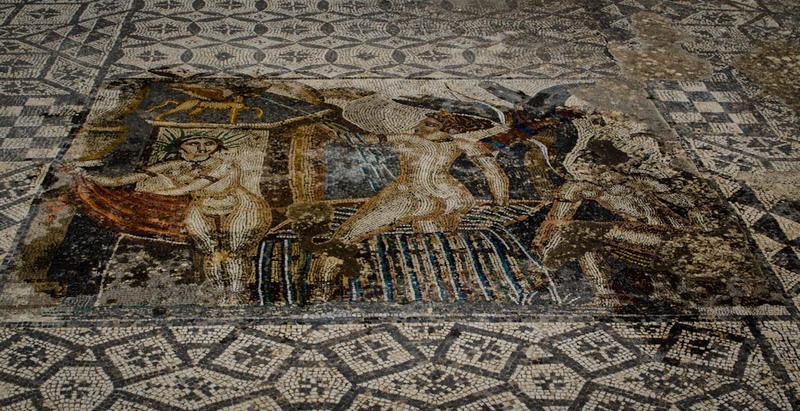 The mosaic floors depict animals, intricate patterns, and Roman Gods including Diana and the 12 tasks of Hercules. It was really impressive. Pictures cannot even begin to capture the detail. 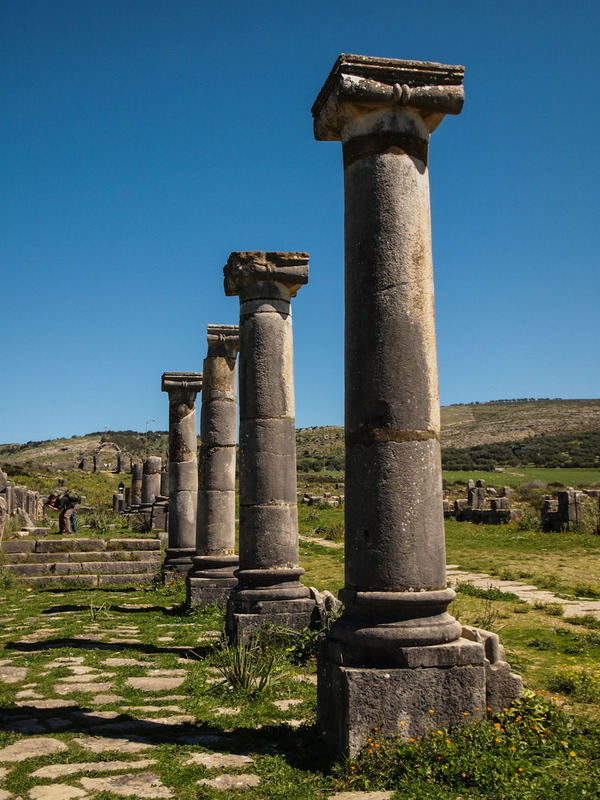 We had initially thought we would spend only a couple hours at Volubilis, but before we knew it, it was late afternoon. 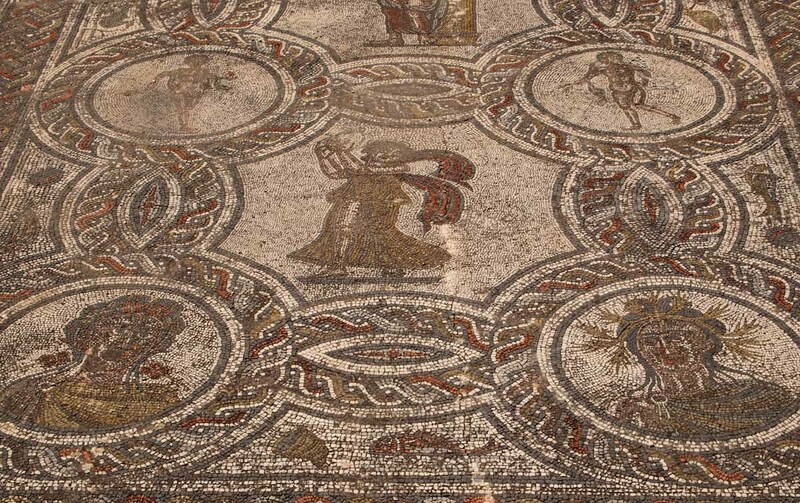 Volubilis seems to go on forever and there seems to always be just one more thing to see. While exploring the ruins, we also met several couples. One was an American couple currently living and working in Paris. After 4 months of being in non-English speaking countries, we were excited to speak with someone other than ourselves in our native language. We spent over an hour talking with them in the hot sun resulting in sunburns! We also met an Italian couple that is currently riding a motorcycle across Morocco. They just laughed when we asked about driving in Morocco. They stated that if you can drive in Rome then you can drive anywhere. I applaud them because those Moroccans are some of the craziest drivers I have ever seen. After spending most of the afternoon enjoying wandering around Volubilis, sadly it was time to say goodbye. I could have easily spent much more time exploring the ruins if we did not have a train to catch. 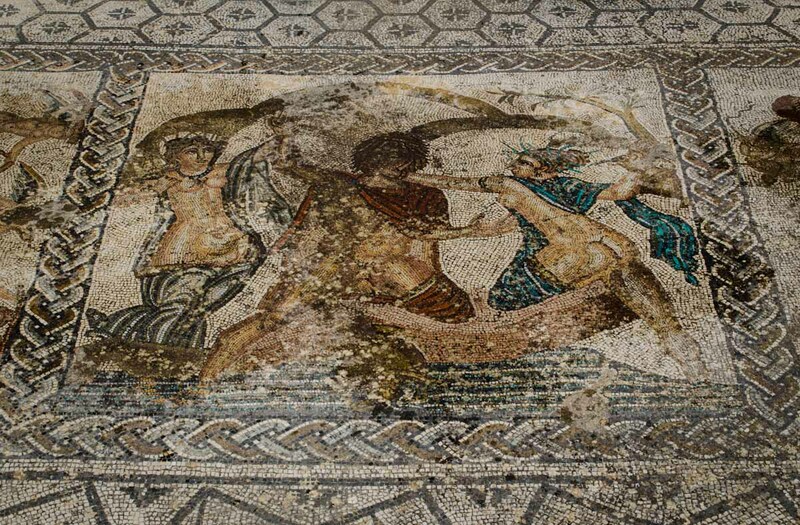 If you are planning a trip to Morocco, I highly recommend adding Volubilis to your list of sites to see. You will not be disappointed. We went on a little Moroccan adventure last week. After 3 weeks of choking on car exhaust, dodging crazy drivers, and listening to the endless honking of car horns, we decided to get out of Morocco’s capital city of Rabat for a couple of days. Kerri had read about some amazing Roman ruins out in the middle of Morocco and they were also listed as a UNESCO Heritage site, something we couldn’t possibly pass up. I was a little concerned about the logistics of getting there, but after a little research, it all seemed pretty simple. In addition, it would be an adventure, something we all needed. Just 5 km from the Roman ruins of Volubilis is Morroco’s most holy city, Moulay Idriss. 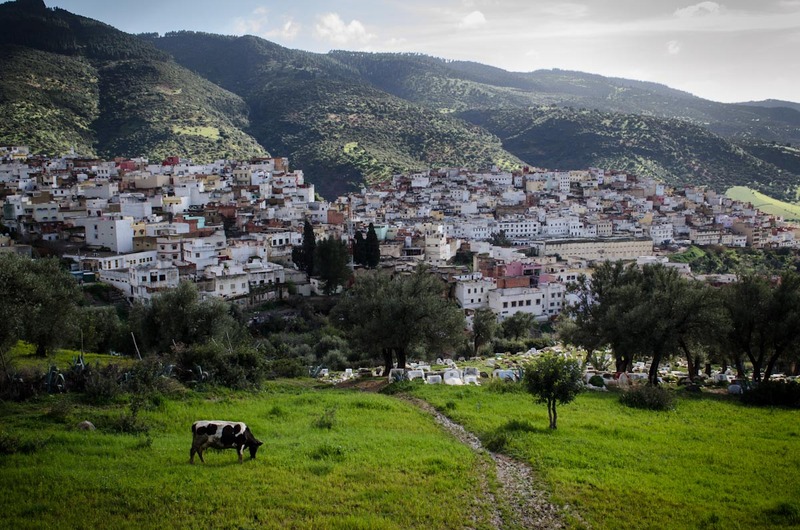 Moulay Idriss is a tiny hillside town that is sacred to Moroccans. 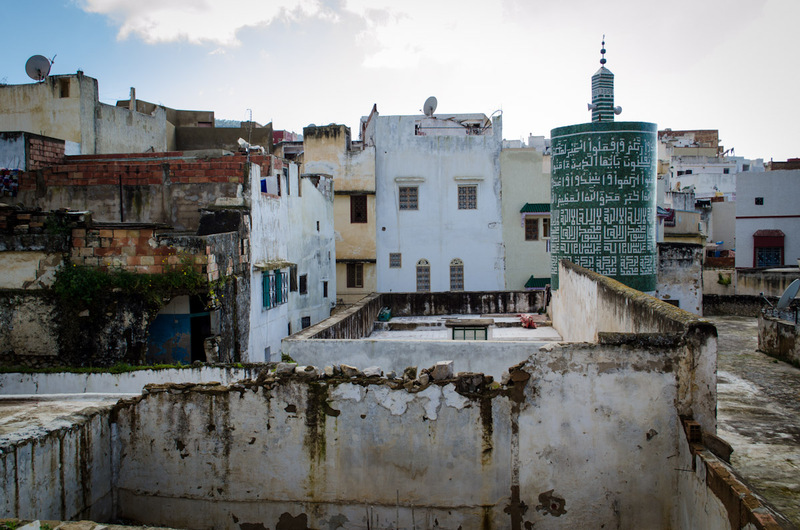 The town marks the spot where Moulay Idriss (the person) arrived in 789 bringing with him the religion of Islam and starting a new dynasty in Morocco. The town has a couple of riads and a hotel where we were hoping to find lodging for the night. So, our plan was to catch the morning train from Rabat to the town of Meknes, which would only take 2 hours. 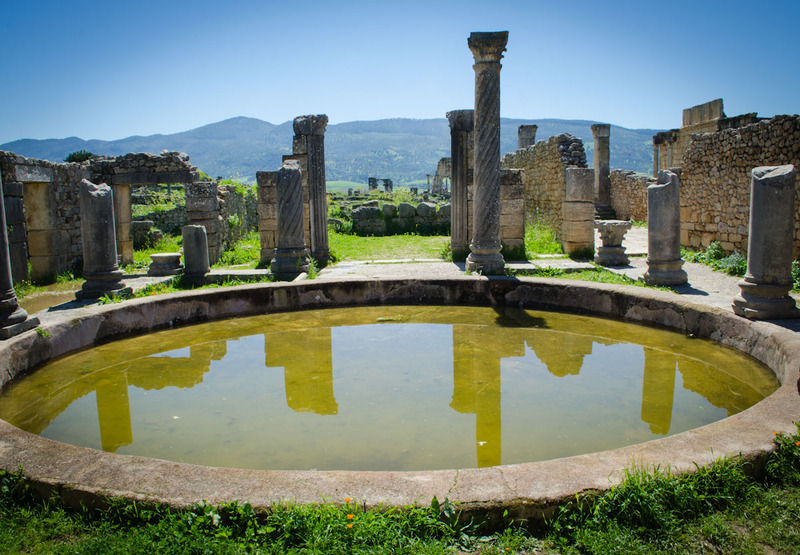 We would then take either a city bus or Grand Taxi out to Moulay Idriss, stay the night, and then walk the 5 km to Volubilis the next day. We had planned to leave Rabat on Tuesday, but after looking at the weather report for Meknes the forecast said heavy rain, which did not sound like fun. So, we waited a day and left Rabat on Wednesday, which had promised better weather. The train ride to Meknes was comfortable and cheap, costing only about $20 USD for all three of us. Once at Meknes we spoke to the taxi drivers outside the train station, who wanted a small fortune to take us to Moulay Idriss. We had read in our guidebook about where the shared taxis meet in Meknes, which would be a much cheaper option. We hopped in a metered petite taxi and got a ride there. 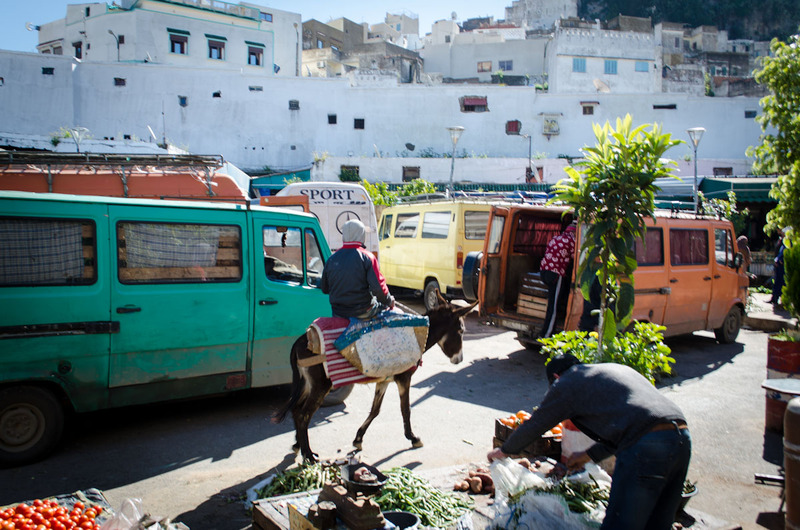 Once at the taxi stand, we spoke to the head honcho and told him we wanted to go to Moulay Idriss. He pointed to a blue Mercedes and said it would be 10 dirhams each, which is only $3.52 total for all three of us. The reason the shared taxis are cheaper is that they do not leave until there are 7 people in the car! After a 25-minute ride crammed into the back of an old Mercedes passing green wheat fields and olive trees, we arrived at a very picturesque hill town. We had no idea what to expect before arriving, but once there we loved it. The town has a great “vibe” to it and feels very comfortable. It was also really quiet compared to Rabat. We checked into the town’s only hotel for 300 Dirhams ($35 USD) for the night, which included breakfast. After being shown a couple of rooms, we got a nice room with a view overlooking someone’s laundry on the roof below us and of the green fields beyond. The room had no television (or heat) but was clean and included a bathroom with shower and a real toilet. It also had hot water! It’s amazing how quickly our standards have changed. We wandered around the town’s narrow labyrinthine streets and took lots of photos. 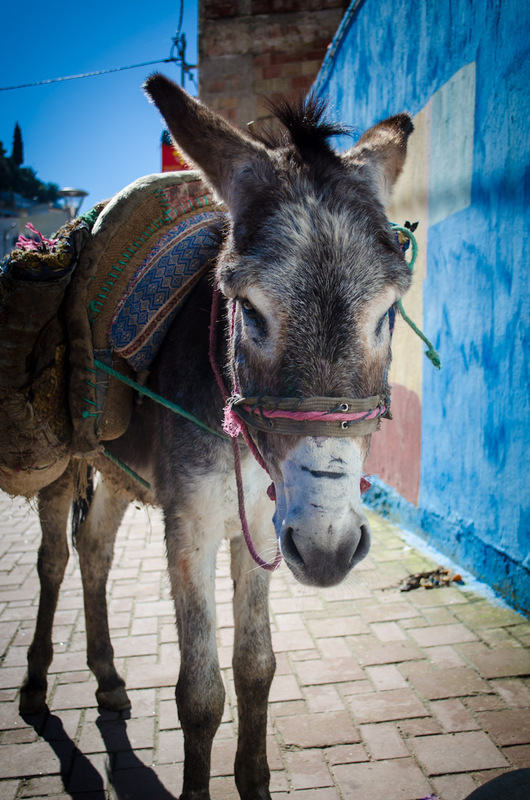 The streets in the town are so narrow that they use donkeys to haul goods up to the houses. The donkeys run up and down through the town with donkey jockeys riding sidesaddle on the goods. The town was really cool and it felt so nice to be out of the big city of Rabat! After wandering the streets of Moulay Idriss we followed a dirt road up a hillside across from the town. The dirt road was cut into a hillside overlooking a cemetery and seemed to be a popular spot for the locals to come and relax. The heavy rains from the day before had caused many landslides and we were glad we had waited a day before coming. It would have been miserable wandering around in the heavy rain. That evening we found a place that looked “clean” to try some of the local cuisine. We ordered the mystery meat skewers and a local dish of vegetables and chicken called tajine. The food was really good, but we were a little shocked when they told us the price. Before even sitting town we went over the prices with the waiter and what everything would cost. It was still cheaper than if the three of us would have hit a fast food restaurant, but we just hate feeling like we got ripped off; even if it is only a couple of dollars. The next morning we woke up to a beautiful blue sky and the sun’s golden rays shining on the town’s colorful hillside buildings. And of course, the Muslim call to prayer. We went up to get breakfast, which was included in the price. The breakfast consisted of flat pancake type bread things called mafrouk, hard-boiled eggs, French bread, Laughing Cow Cheese, fresh squeezed orange juice, and coffee. After checking out of the hotel we bought a bottle of water and made our way down the hill towards the ancient Roman ruins of Volubilis. The 5 km walk was nice as we passed wheat fields and ancient olive trees. 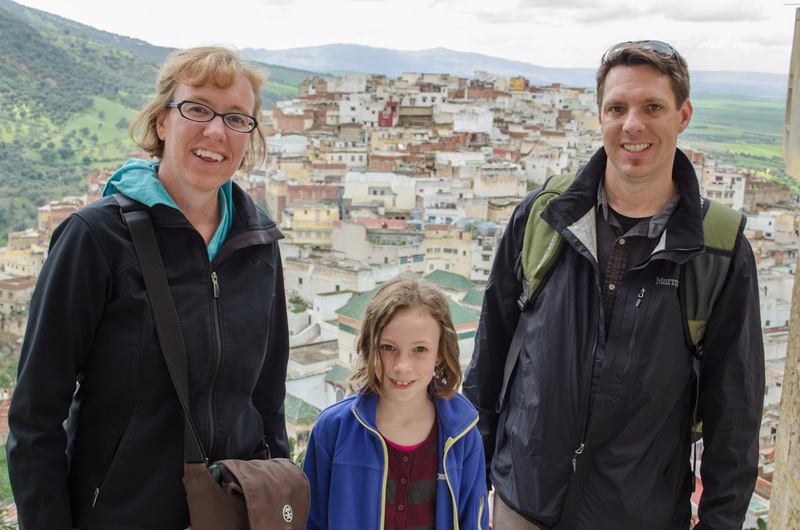 We could have easily spent a few more days in Moulay Idriss, and we probably would have if we had packed more clothing. The town is very picturesque and feels very cozy and safe. 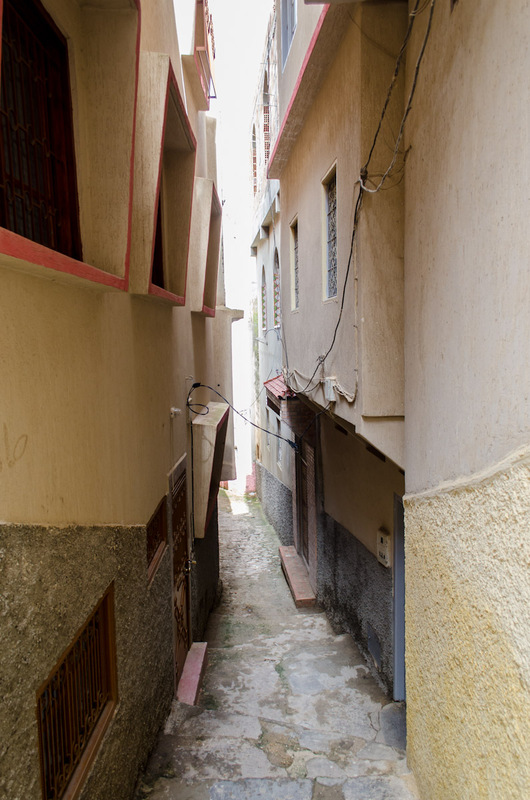 If you plan to visit Morocco, we highly recommend staying at least two nights in Moulay Idriss.